With Steve sending audio & me still sending in emails, we were bound to eventually team up to contribute audio together for the Australia Desk. From that we developed our very own PCDU. These days the Airplane Geeks are Max Flight, Rob Mark & David Vanderhoof. Courtney had to move on when a new job consumed all of his time but Dan Webb stepped in for a few years until he too had to move on due to his new work. 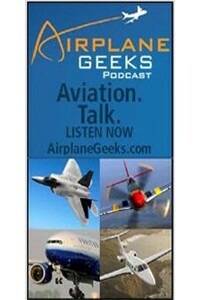 The Airplane Geeks podcast has news discussions, guests, segments from other providers and listener feedback, all around the topics of airlines, GA, military and history. Contributors provide input from Australia and the UK (& Europe) while co-host David provides an aviation history segment or the “Airplane of the Week” segment which gives a synopsis of the history of a given aircraft. In addition to spinning off a number of other great aviation shows (such as Plane Crazy Down Under :) ), the Geeks have set the standard for regular, high quality aviation content for their large audience. I really enjoy this show and it’s one of the few that immediately go to the top of my playlist on my podcast device. From interesting guests to insightful commentary (and no small amount of banter), every episode is worth listening to and enjoyable. I’ve learned things, debated things and even appeared on the show a couple of times live (not just in the Australia Desk). If this show is not in your regular list of aviation shows, you’re really missing out!